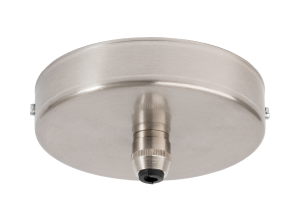 All of our pendant lights are available with a choice of ceiling roses that allow you to customise the light to suit your interior. 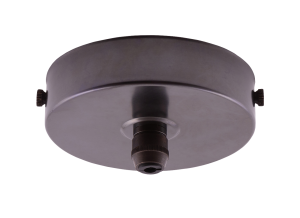 We offer two distinct styles of ceiling rose. Option 1 is a cap and comes at no additional charge. Option 2 is a cup which you can upgrade to for an additional cost. Both options can be used in both domestic and commercial environments, provided that they are installed as per the diagrams below. 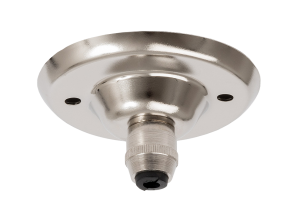 This is a standard Besa cap designed to work with standard conduit. Its diameter is 7.5cm. It is also possible to use this without conduit, as per the installation diagram, available below, but the connections must be housed in a suitable insulted box. For an additional charge, you can upgrade to a cup fixture. This is a strapped cup with a diameter of 10cm and depth of 2cm. 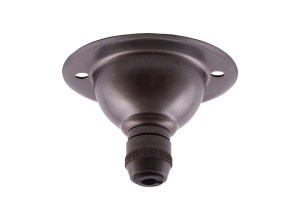 This larger size allows you to house the wire connections within the rose itself. This is a more traditional way of installing domestic lighting as it requires no conduit or extra space in the ceiling cavity. Please note that these instructions are provided as a guidance only as each installation is different. All of our lights should be installed by a qualified electrician to ensure the safety of the fixture.